Cap and sleeve fit on virtually any 8oz canning jar. Dishwasher safe top rack. Do not place in microwave. Includes: 1 cap and 1 silicone sleeve (Glass Jar is not included). The EIO cap and silicone sleeve are designed to fit on most 8oz glass canning jars. This lets you create the perfect glass training cup while using a glass canning jar that most of us already have, or can easily purchase at any grocery store. EIO Kids Cup Cap and Sleeve for 8oz canning jar. For ages 2 years and older. Totally BPA free. Unmatched Versatility. Environmentally Friendly. 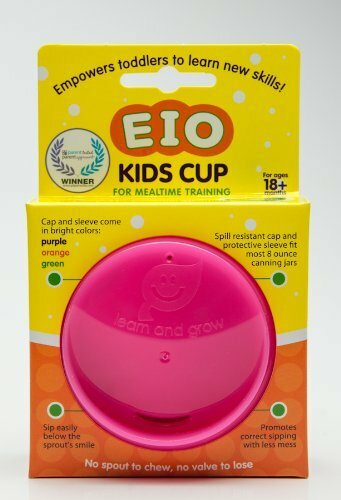 Starting with genuine, durable canning jars, EIO's unique design offers the only spill-resistant toddler training cup designed for convenience and health benefits. Available in: Orange, Green, or Purple. The Kids Cup is a spout-free, valve-free cup made without BPA, Phthalates and PVC, and is designed to transition young children properly from bottles to real glass dinnerware. Sippy cup spouts and valves necessitate a bottle-like sucking motion, but EIO's unique cap promotes correct sipping, quickly and with less mess! </P> Give them confidence. Give yourself convenience. EIO is a one of kind kids cup. Our cap and sleeve fit on virtually any 8oz canning jar. The sleeve is easy to remove and can be left on the cup for washing. How's that for convenience? </P> We lost the valve... so you won't! EIO's cap is specifically designed without small parts, like the easy-to-lose valve. According to the ADA's recommendations for better dental development, children over the age of one should drink from a cup without a valve (* From The Journal of the American Dental Association, Vol. 135, No 3, 387). Spouts can also be detrimental, as they tend to become chew toys. EIO encourages a healthy, natural transition to cups. </P> Clearly, it's EIO for years to come. Our modern design appeals to kids of all ages and our versatility allows you to use the jar without the cap as your child learns new skills. The sleeve offers a flashy style and grippy surface no matter how old you are! Never throw them away. That's great news for our environment!